Mat Kearney enjoys growing success; new album is "City of Black & White"
Kearney has earned airplay on TV, including "Grey's Anatomy"
LOS ANGELES, California (CNN) -- Mat Kearney has every right to be frustrated. 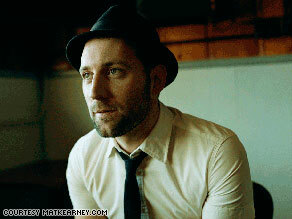 Mat Kearney's music has gotten a boost through music video channels and "Grey's Anatomy." As he walks to his tour bus behind Hollywood's Palladium -- where he'll play in a few hours -- he's already had to cope with logistical snafus, shortened sound checks and general confusion. And the tour is just beginning. There are more than 30 cities and 10 weeks to come. But as he approaches the bus, he is completely overtaken by an obscure flower hanging off a fence behind the venue. "I've never seen anything like that," he says, looking at the blue-and-white bloom. "I've got to take one of these." Kearney should be smelling the flowers. His music, such as the song "Nothing Left to Lose," has received consistent airplay on music TV channels -- which earned him a headlining slot on a VH1-sponsored tour -- and repeated appearances in TV and film. Most notably, "Grey's Anatomy" used his song "Breathe In, Breathe Out." The Oregon-born musician, 30, sat down with CNN to talk about his songwriting journey, combining a big sound with personal observations and a certain "weird TV show." The following is an edited version of that interview. CNN: How important was Nashville, Tennessee, in your decision to be a songwriter? Mat Kearney: The first year I moved to Nashville, I started playing these songwriter nights with people like Nickel Creek, Duncan Sheik and even Ryan Adams. ... That was the first place I really started playing music and I had to really step up my game. Really quick. Or get kicked off the stage. CNN: This whirlwind world tour you completed last year -- how did it impact this new album and you personally? So, [the tour] created this void for wanting to connect in a local way. So many things happen when you're not out there running and gunning. Falling in love with someone, getting your heart broken, being around friends -- that stuff can only happen when you stick around for a while. CNN: What's the significance of the title -- "City of Black & White"? Kearney: The title track I wrote in Istanbul. We stayed in this place that overlooked the Bosporus, which splits Europe from Asia. The song is about worlds colliding, being that far away from home, and also longing to be with someone you love in that distant land. ... It seemed like a good cornerstone to build the record on. CNN: You're an avid traveler, but this record is more concerned with planting roots. How do you reconcile the two? Kearney: I don't think, to be a traveler, you have to reject setting roots up. That's the fun of this whole journey for me. There are people I love in Nashville and would not want to go a day without talking to, but I want to see the world. The record is coming out of an experience of reconciling those two things. I played 275 shows for two years straight. You have to travel between those shows. So you're gone. Some of those experiences shape the record. There's a romantic side to it. This isn't a one-night stand record. It's not youthful idealism that's going after the masses. There's some ideas of, say, that prodigal son who has walked away from you and you're sitting there saying, "I'm here for you if you need me." CNN: The sound is big but the lyrics are intensely personal. How did you meld those ideas together? Kearney: Yeah, it's like the biggest song is one of the most personal. "Fire and Rain" [not the James Taylor song] is a crazy four-on-the-floor song, but it's a song about someone who has left you. Something about the juxtaposition of those two seem so interesting to me. I didn't plan it. It just kind of happened. CNN: You're one of the last musicians I have seen actually get airplay on [music television channels], and you broke through because of it. Kearney: It's interesting how my music has gained success being accompanied by images. When I was in college I wanted to study film. My first passion was to be a cinematographer. So maybe there's something innate in my music where it partners well with images. It's worked on weird TV shows where doctors are making out and people getting logs pulled out of their stomachs [laughs]. Somehow my music seems to work with that. CNN: How did your music become such an integral part of that show ["Grey's Anatomy"]? Kearney: I really don't know. Somebody somewhere ... started using these songs and they seem to work. There are certain songs that lend themselves to images. No one's licensing [Katy Perry's] "I Kissed a Girl" and putting it in shows. That's a narrow-focused message that doesn't need much [in the way of] images.